Shostakovich was recognized from an early age as one of Russia’s great composers. He completed his first symphony at 19 and by 26, his film scores, Cello Sonata and first string quartet were admired. His opera, Lady MacBeth of Mtsensk, played for nearly two years to rave reviews … until one day in 1936 when Joseph Stalin was in the audience. The next morning, the headline in Pravda read, Muddle instead of Music. The article claimed his music was too formalistic, not nationalistic enough. This was during “The Great Purge,” a period between 1934-37 when millions of Russian citizens were imprisoned, executed or sent to the Gulag never to be heard from again. This kind of public criticism could have had the same result for Shostakovich. Thus began a lifetime of living in fear. Shostakovich had already completed his 4th Symphony but with such frightening criticism preceding the premiere, he felt it best to cancel. Instead he began work on another symphony in the hope of regaining the favor of the authorities. Symphony No. 5 premiered in 1937 and was an enormous success. 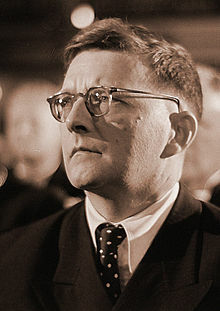 For a time, Shostakovich could continue his work. In 1948, he would suffer another round of criticism – much more severe. When we perform the symphony on April 29 and May 6, we will try to portray the vast spectrum of emotion present in this work – extreme sadness, painful loneliness, fevered aggression, exuberant triumph – with the goal of bringing our audience with us to those powerful places where only music can take us.